Images of books appear in art, advertising and commercial logos to symbolize learning, knowledge and wisdom. In religious and secular rituals around the globe, people carry, show, wave, touch and kiss books and other texts, as well as read them. Such images and rituals utilize the iconic dimension of texts. 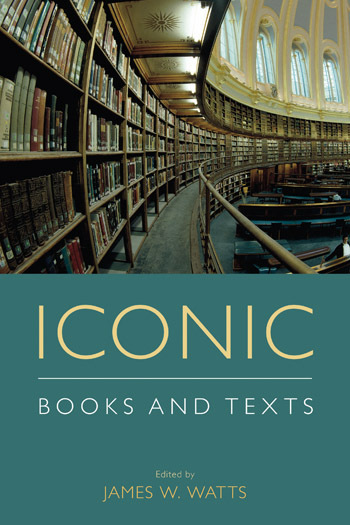 This volume is the first comprehensive survey of iconic books and texts. It traces their development and influence from ancient to modern times and compares their roles in multiple cultures and religious traditions. The twenty-two essays presented here are original, cutting-edge contributions to this new academic field, and will appeal to students and scholars across the study of religions, literature, book history, archives and libraries. This chapter proposes a new model for understanding the ways that scriptures function. It theorizes the nature of scriptures as a function of their ritualization in three dimensions—semantic, performative, and iconic. It also provides a means for conceptualizing how traditions ritualize scriptures and how they claim and negotiate social power through this process. This chapter discusses difficulties of differentiating “religious” from “cultural” phenomena, as well as “scriptures” from “classics.” It further discusses how it may be possible to study “scriptural” texts constructively in shared discourse with scholars of differing religious backgrounds. Such a common discourse would be facilitated by a heuristic model of scripture as a text extending functionally in two directions, towards the human through interpretation and towards an Absolute or Transcendent ontologically. This chapter analyzes early Christian rituals in which the Bible functions as an icon, that is, as a material object that invokes the presence of the divine. It provides an introductory discussion of icons, and it further shows that early Christian communal rituals of Gospel procession and display as well as popular and private ritual uses of scripture as a miracle-working object parallel the uses and functions of Orthodox portrait icons while circumventing issues of idolatry. This chapter surveys the history of the early medieval book, especially the transmission of religious texts in the codex format, in order to understand how the material form of the book itself came to take on religious significance. This chapter focuses on the visible forms of words that can stir emotional and even sacred responses in the eyes of their beholders. Thus words can be said to function iconically, affecting a mutually engaging form of “religious seeing.” The way words appear to their readers will change the reader’s interaction, devotion, and interpretation. This chapter describes two modes of crossing the boundaries between the book as an object of reading and the book as an object of viewing. In both traditions, the iconic dimension of the book bypasses the textual level and highlights the visual level. This chapter suggests that Buddhist images of books are like sculptural snapshots. These are not images not to be worshipped—although the main goddesses or bodhisattvas presented in the images were certainly objects of veneration— but they are images of worship. This chapter draws on the images from sixteenth-century publications in the Digital Image Archive to explore how books are used in printed images related to biblical interpretation. The investigation finds that images of books are used: (1) to indicate authorship of biblical works; (2) to defend the orthodoxy of later writers; (3) to affirm the learning, piety, and social standing of certain writers, saints, and other figures from antiquity; (4) to contend that the message and ministries of certain biblical figures were based on Scripture; and (5) to link antiquity with the Early Modern period. Muṣḥaf is what Muslims call the physical body of the Qur’an, its pages, binding, and print. Scholars traditionally focused on the textual analysis of the Qur’an as theological, political, historical or literary productions, favoring a semantic dimension of the text and detaching it from its materiality. 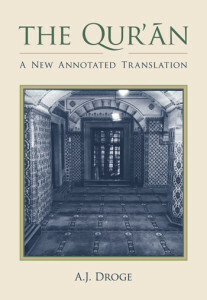 In this chapter the author proposes to shift our attention from the understanding of the Qur’an exclusively as message to its material existence as muṣḥaf in the hands of its manufacturers and users in order to highlight the process through which the status of the Qur’an as a sacred message is negotiated. This chapter discusses a distinction that requires closer examination and theorization in the discourse on iconic books and other scriptures: the difference between iconic object and cultural icon. Various questions are explored through particular focus on the relationship between the particular iconicities of particular print Bibles, as iconic objects, and the general iconicity of the cultural icon of the Bible. By examining how people engage with their personal Bibles, scholars can better understand how status and authority is generated not only through semantic meaning, but also through material and embodied actions. This chapter looks at the display of worn-out Bibles and the discourses that surround the phenomena of duct-taped Bibles. This chapter describes the idea of the Book of Shadows (BoS) within both historical and contemporary Wicca/Neopagan Witchcraft, focusing specifically on how the BoS may be understood as “scripture.” The concept of “scripture” within this work is defined as a tripartite matrix of textuality, performance, and iconicity. The Sikhs have perhaps taken the concept of a sacred scripture much further than any other religious community by treating the Guru Granth Sahib as a living guru. This chapter analyzes various religious beliefs and practices by which contemporary Sikhs construct and maintain conceptions of their scripture as a guru with spiritual authority. This chapter discusses Gita Jayanti and the embodiment of God as the Book and the Book as God. For over a decade, various Hindu organizations in Singapore have joined to celebrate an extraordinary series of events, called the Gita Jayanti. The term jayanti literally means “victory” or “victorious” but more usually indicates celebration of the birthday of a holy figure or a deity. Put simply, this is a birthday celebration for the Gita, a compact text that increasingly functions in the Hindu diaspora much like the Bible—a portable compendium of teachings, a deeply poetic source of individual comfort, a text to be memorized, chanted, studied. This chapter discusses the need for the iconic status and function of Buddhist scripture to receive more attention by illuminating how lay Korean Buddhists try to appropriate the power of sutras. The oral and aural aspects of scripture provide only a limited understanding of the characteristics of scripture. This chapter surveys magical and mantic uses of the Bible as attested in British folklore reports, with an eye to developing a model of the Biblicist tradition as that tradition was received by the British laity. The evidence shows that (1) in contrast to the church’s emphasis on the Bible’s meaning, the laity exploited the Bible’s textual and artifactual properties as supernatural means to practical ends; (2) charmers made use of particular biblical texts, whereas the Bible generally was used in exorcisms, which seem to have remained the purview of clergy; (3) lay traditions about the Bible seem to have been focused on specific issues, though a general uncertainty about what powers Bibles might have is also indicated. This chapter examines controversies arising from the perception of the instruments of cultural memory and the logic of their transmissibility. Wampum is symbolic, or iconic, of a long and enduring lineage of immigrant and indigenous relationships in North America throughout the colonial and into the American period. Wampum almost always represented co-habitation agreements for how diametrically different human communities could live together on the same lands. A vivid example is the George Washington Wampum Belt created by the U.S. government to commemorate the Canandaigua Treaty of 1794. Vitally important for understanding this agreement is that wampum is a sacred and ceremonial material that has been utilized by the Haudenosaunee since time immemorial until the present day. This chapter considers the intersection of Christian and imperial memory in the physical Gospel book. Besides describing the function of gospel books in the post-Constantine Roman Empire, it examines the connection between the Roman construction and production of sites of memory that established Roman imperium in the Mediterranean and the development of the Christian Gospel codex as a site of memory within Christianity. It also explores the related issues of imperial and divine power as manifest through material things, the rhetoric of seeing and iconicity, and the invented tradition of Christian orthodoxy. This chapter suggests that the conflicted perceptions of gender in Ben Sira’s text is fundamental to his appropriation of, and attempt to produce, authoritative religious literature, and thus essential for understanding his relationship to this emerging canon. This chapter probes the origins of iconic textuality in the ancient Near East, informed by post-colonial perspectives on iconic texts. The surviving art and texts from ancient Egypt and Mesopotamia exhibit at least four forms of iconic textuality: monumental inscriptions, portraits of scribes, displays and manipulations of ritual texts, and beliefs in heavenly texts. Individual chapters are available for purchase. Where applicable, VAT will be charged at the prevailing rate. Iconic Books and Texts should be praised for infusing into the study of religion a long-awaited and broader focus on the material side of the religious text. The essays in this volume creatively and effectively draw together different historical epochs, varied religious and cultural traditions and ritual practices, and diverse scholarly methodologies to create a finely woven tapestry depicting the enduring, transcultural, and mutually supportive significances of iconic books and texts. In addition to giving these previously published essays a wider audience, this collection will help foster meaningful cross-disciplinary conversation between readers interested in all aspects of the history of the book. An engaging, accessible, and important contribution to the intersection of textual studies and the analysis of material and visual culture. I highly recommend this volume to those interested in reflecting on the value of the Qur'an both today and in the past through cross-cultural comparison and new perspectives.